What are the benefits of Vitamin E? How vitamin E beneficial for skin, hair and health? 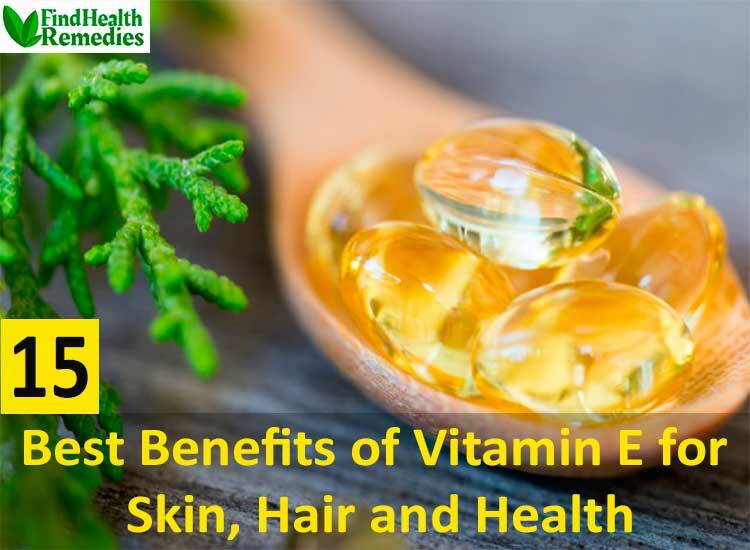 In this article we are listing 15 best benefits of vitamin E for skin, hair and health. Vitamin E is very popular to deal with various health, hair and skin related problems. Heart and blood blocked arteries, high blood pressure, hardened arteries in the leg, varicose veins, diabetes and many more problems can be treated with the help of vitamin E. You should include the vitamin E riched foods, nuts, fruits etc in your regular diets. Keep reading to know more about vitamin E benefits. Vitamin E is a very popular natural ingredient that acts as moisturizer. It is an oil-soluble nutrient that helps to restore the moisture of your skin. Vitamin E is very beneficial for dry and damaged skin to restore the moisture and rejuvenates your skin. Vitamin E is very helpful to control the premature aging effect. Vitamin E works as ant aging ingredient. If your skin become dull, affected with wrinkles, fine lines then vitamin E will be helpful to remove these skin problems. Vitamin E works to improve the collagen production that helps to improve the skin elasticity. Vitamin E is also beneficial to treat the sunburn. Vitamin E contains antioxidants properties which help to neutralize the effects of free radicals and soothing sunburns. This is very effective solution for sunburn recovery. Vitamin E is also beneficial to treat lightens dark spots. Vitamin E is very helpful to control dark spots. It helps remove dead skin cells from your face and lightens dark spots. Vitamin E works as a cleaning agent. Vitamin E is an emollient that is helpful to remove impurities from the skin surface. It also beneficial to maintain the pH level and oil balance of skin. Vitamin E is very helpful and effective to remove the stretch marks of your skin. Actually stretch marks appear because of the reduction of skin elasticity. Regular application of vitamin E helps to recover the elasticity of skin and treat the stretch marks. Vitamin E oil is also helpful to treat the minor burns. Vitamin E contains the curative powers and the ability to treat the wounds by small burns and injuries. Vitamin E oil is beneficial to lighten scare. Vitamin E oil is deeply penetrated into the skin that helps to repair the scar tissue of skin. Scare due to minor burns and acne can also be treated by vitamin E oil effectively. Vitamin E is helpful to treat the skin disorder. Vitamin E contains antioxidant property that helps to supple and combats the dryness of skin, eczema, psoriasis and restores skin elasticity as well. Vitamin E oil is very effective to soothing pain from cold sores. Vitamin E oil works as moisturizer and treat the dryness problem of skin resulting from a cold sore. Vitamin E oil is very beneficial for hair growth. Long and thick hair can be the dream of every woman. Vitamin E contains antioxidants that improve the blood circulation of the scalp which helps to improving hair growth. Vitamin E is effective to repairs damaged hair follicles and in result makes your hair longer. Premature graying hair is the common problem now days because of unhealthy diets, pollution, chemically filled shampoo etc. Vitamin E will help you to prevent the premature graying hair. Vitamin E contains antioxidants that help to prevent the corrosion of tissues, and reduce the premature graying. Vitamin E is also beneficial to accumulation the bad cholesterol. It helps improving blood circulation to cure the heart attack risk. Vitamin E oil will be effectively to treat the heart and lungs problems. You must need to include the vitamin E in your daily diets to be healthy. Vitamin E is beneficial to treat the cystic fibrosis in babies. Vitamin E helps to maintain the adequate weight and alleviate pancreatic blockage. Vitamin E supplements are beneficial to fight off the effects of cystic fibrosis. Include the vitamin E supplements in your and your children diets. Vitamin E is an effective nutrient that helps to require for maintain the deficiency. Vitamin E helps development and maintaining of the human body. There are several deficiencies such as skin dryness, cataract, anemia, leg cramps, and gastrointestinal problem. Vitamin E will be helpful to recover from all these deficiencies. You should include the vitamin E in your daily diets. In this article you have gone through with 15 best effective benefits of vitamin E for skin, hair and health. You should use this beneficial oil in your daily routine. Also please share this informative post to your friends and known ones so that they can also take the advantage of these benefits of vitamin E.